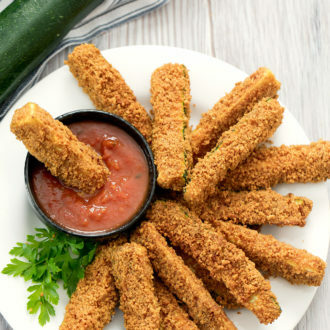 These zucchini fries make a great snack or side dish. You can dip them in your favorite dipping sauce. I dipped mine in a no sugar added marinara sauce. I purchased an air fryer a few months ago and love using it. I love how I can enjoy foods that taste like they’ve been deep fried without using all that oil and without the hassle of frying. It’s also faster than baking. Today, I’m sharing with you two methods of making these fries. Both methods produce super crispy and delicious fries. However, one method is quick and easy and the other takes a few more steps and produces a more even colored golden coating. 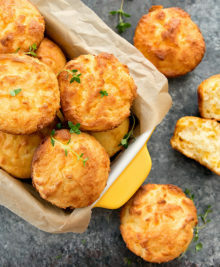 I used the same low carb keto breading that I used for my crispy low carb cauliflower bites. The low carb keto breading is a mix of almond flour and finely grated parmesan cheese. The breading sticks on fairly well and works like breadcrumbs. The parmesan cheese needs to be finely grated until it resembles grains of sand. When mixed in with the almond flour, the two ingredients should be almost indistinguishable because they will roughly be the same color and size. This easy method produces crispy delicious zucchini fries in a short amount of time. The only downside is that because they are baked or cooked in the air fryer, the outer coating will brown unevenly and isn’t perfectly golden brown. But if the presentation doesn’t matter, this method is much easier and tastes about the same as the second method. 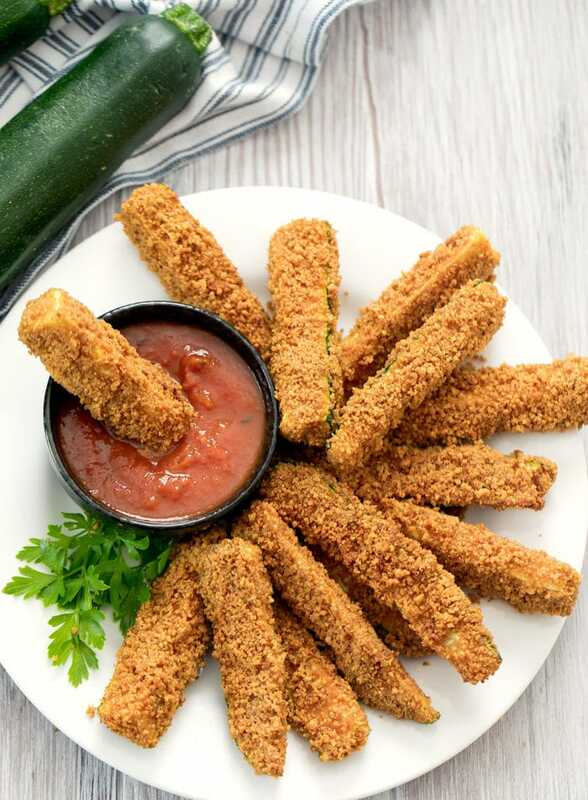 To make the zucchini fries the easy way, zucchini is first coated in egg wash. After it is fully coated, shake it a few times, making sure to shake off any excess egg drippings back into the egg bowl before adding it to the breading. The reason for doing this is that you don’t want the egg drippings going into the breading. The moisture will cause the breading to clump and they will no longer stick to the zucchini. Then place the zucchini onto a small mound of bread crumbs, applying a little pressure so the breading sticks to the bottom of the zucchini. Spoon a small amount of breading over the zucchini and then use your fingers to press the breading onto the zucchini until it is fully coated. Because of its slippery surface, it is better to press the bread crumbs on rather than trying to roll the zucchini in the bread crumbs. Once all the zucchini fries are coated, they are ready to be baked or cooked in the air fryer. To bake the fries, generously spray the surface of the fries with cooking oil spray. Bake in oven at 400F until crispy. This can take 25-35 minutes. To cook the fries in the air fryer, generously spray the surface of the fries with cooking oil spray. Set your air fryer to 375F. Cook for about 10-12 minutes, flipping halfway, until crispy. This method produces zucchini fries with a golden coating, similar to results if they were deep fried. It makes for a much nicer presentation but it requires a few additional steps that add more time. 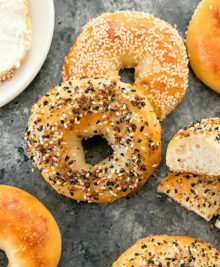 The key to getting an even golden coating when baking or using the air fryer is to pre-toast the bread crumbs. 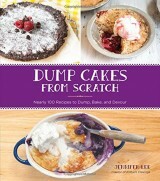 I use a similar method when I make crispy baked panko recipes. It’s easier with panko as you just need to toast ahead of time and then the bread crumbs are ready to be used. It’s a little more complicated with the low carb coating. 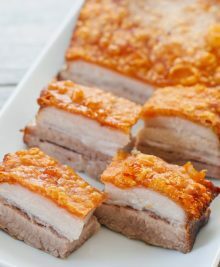 The low carb coating uses parmesan cheese and almond flour to act as the bread crumbs. They are spread out to a thin layer and lightly sprayed with cooking oil. 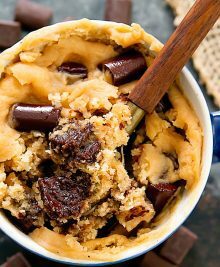 The mixture is then baked until it turns a light golden brown. You do need to keep your eye on the breadcrumb mixture because they go from light brown to dark brown very fast. You don’t want the crumbs too dark because they will be getting cooked a second time. Because the bread crumbs mixture is made partly of parmesan cheese, it does melt and clump a little in the oven. So you do need to let these cool and then break up the mixture again before coating the zucchini in the crumbs. After that, you follow the same coating steps outlined in the first method. Then you cook the zucchini in air fryer or oven until crispy. If I’m just making these for myself, I prefer the easy method. But if you’re looking for a prettier presentation, the second method makes for a nicer presentation. If baking fries, preheat oven to 400F. Line a baking sheet with parchment paper and set aside. If not baking, skip this step and move on to the next step. 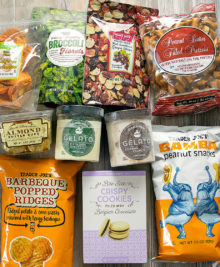 Assemble your coating ingredients. In a small bowl, whisk eggs with heavy cream. Set aside. 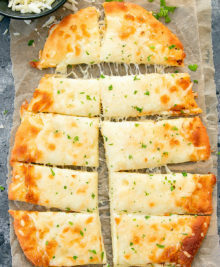 In a medium bowl, whisk together almond flour, cheese, garlic powder. Set aside. Line the part of your work station where you will be coating the zucchini with parchment paper. Spoon a small amount of breading onto the parchment paper (just enough to cover the bottom of a zucchini fry). Dip a zucchini fry in the egg wash. After it is fully coated, shake it a few times, making sure to shake off any excess egg drippings back into the egg bowl before adding it to the breading. The reason for doing this is that you don't want the egg drippings going into the breading. The moisture will cause the breading to clump and they will no longer stick to the zucchini. 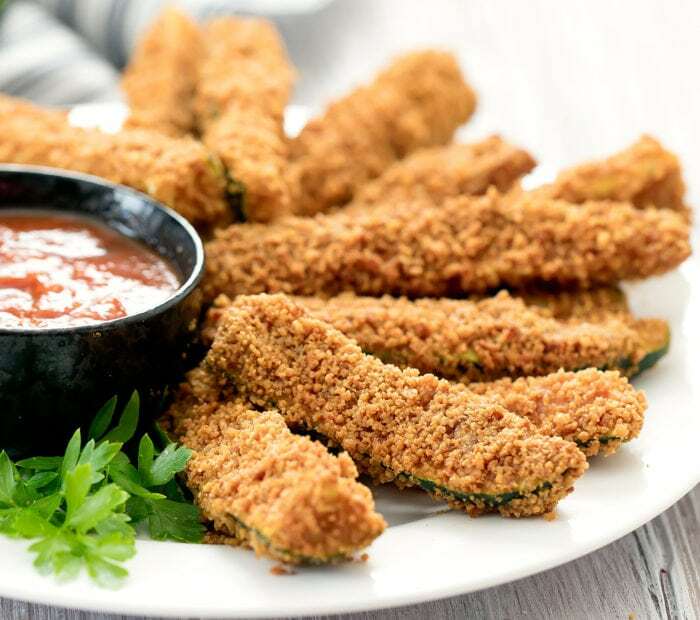 Place the zucchini fry onto the small mound of bread crumbs, applying a little pressure so those breading sticks to the bottom of the zucchini. Wipe your hand that was holding the zucchini so that your hand is also dry before touching the breading. Spoon a small amount of breading over the zucchini and then use your fingers to press the breading onto the zucchini fry until it is fully coated. This is more effective at coating then rolling the zucchini in the bread crumbs. Carefully set the zucchini fry onto your prepared baking sheet (if baking) or into your air fryer if using air fryer. Repeat with remaining zucchini fries. Spray surface of zucchini fries with cooking oil spray. 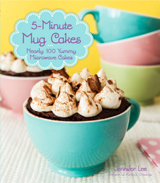 If baking, bake in preheat oven until coating is crispy (about 25-35 minutes). You can broil for the last few minutes to add some more color to your coating. If cooking in air fryer, set temperature of air fryer to 375F and cook for about 10 minutes, flipping zucchini halfway, until coating is crispy. Whisk together almond flour, cheese and garlic powder. Spread mixture across lined baking sheet, creating a thin even layer. Spray surface of crumbs with cooking oil spray. Bake in oven for about 5-6 minutes, or until lightly browned. Some of the coating may have clumped together during this cooking process. Allow crumbs to cool. You can speed up the cooling process by sticking them in the fridge. Once cooled, break up any clumps by hand or with food processor. You can reuse the same lined baking sheet if you are baking the fries later. Assemble your coating ingredients. In a small bowl, whisk eggs with heavy cream. Set aside. In a medium bowl, add pretoasted bread crumbs. Follow steps 3-7 in the first method. 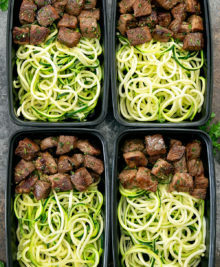 If baking, bake in oven at 400F until zucchini is tender and coating turns a dark golden brown (about 12-15 minutes). If cooking in air fryer, set temperature of air fryer to 375F and cook for about 5-7 minutes, flipping zucchini halfway, until coating is dark golden brown and zucchini is tender. 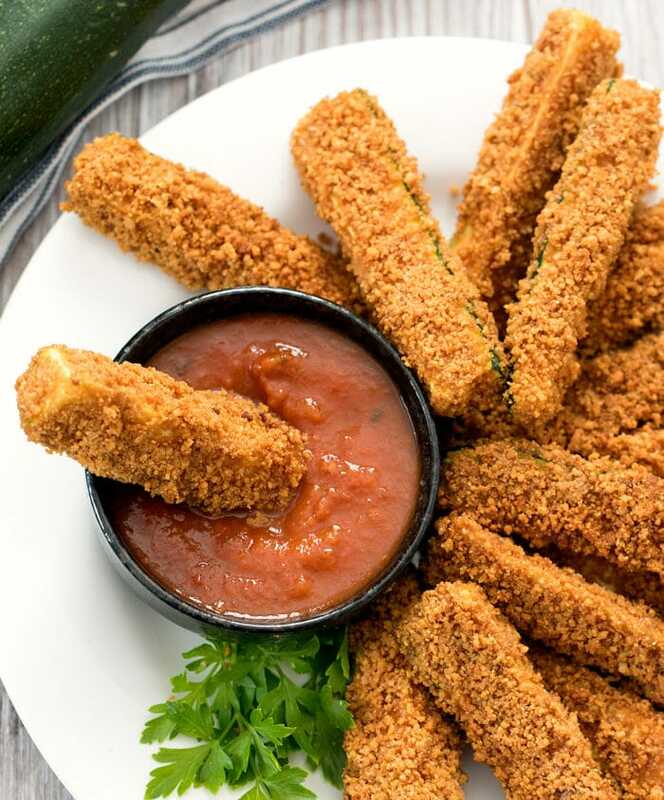 To make thick zucchini fries, slice zucchini in half lengthwise and then divide each half into fourths. So each zucchini produces 8 thick fries. You can make your fries thinner but you will likely need more breading. The finely grated parmesan cheese should be the size of grains of sand. You can grate with a cheese grater. Or you can take shredded parmesan cheese and place into a food processor and pulse until it becomes the size of grains of sand. You can buy no sugar added marinara sauce or use this homemade one. I highly recommend whisking heavy cream with the egg for the egg wash. Just whisked egg is very thin, but adding the heavy cream creates a thicker egg wash that coats and stays on the zucchini better and helps the breading stay on. I have tried with just egg and the breading did not stick on as well. Nutritional information does not include cooking oil spray. Nutrition facts assume all of the egg wash and breading is used, but in actuality, you will have some leftover, so the carb count is slightly less.